Carousel Coral: What's In My Travel Makeup Bag - Summer Edition. 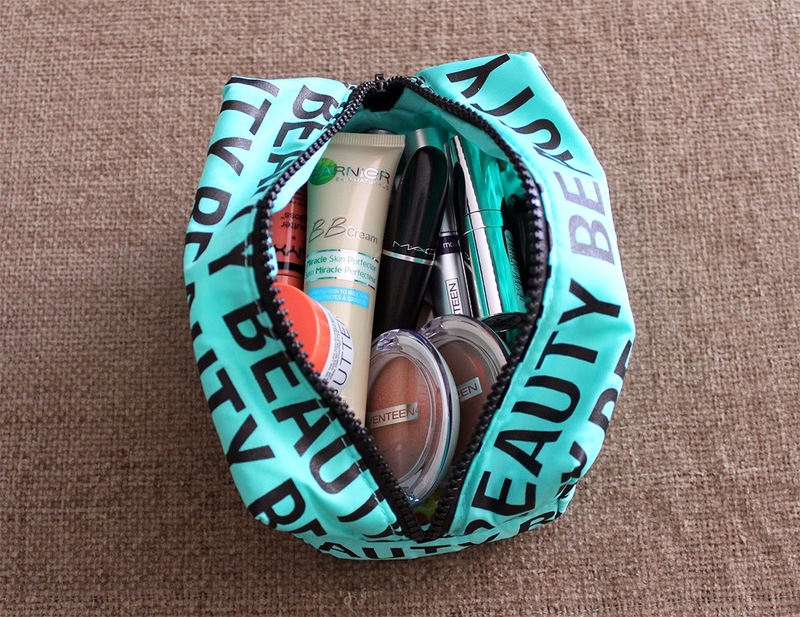 What's In My Travel Makeup Bag - Summer Edition. Hello everybody! How's everyone doing? Tomorrow I'm leaving for my summer vacation (Naxos here I come!! 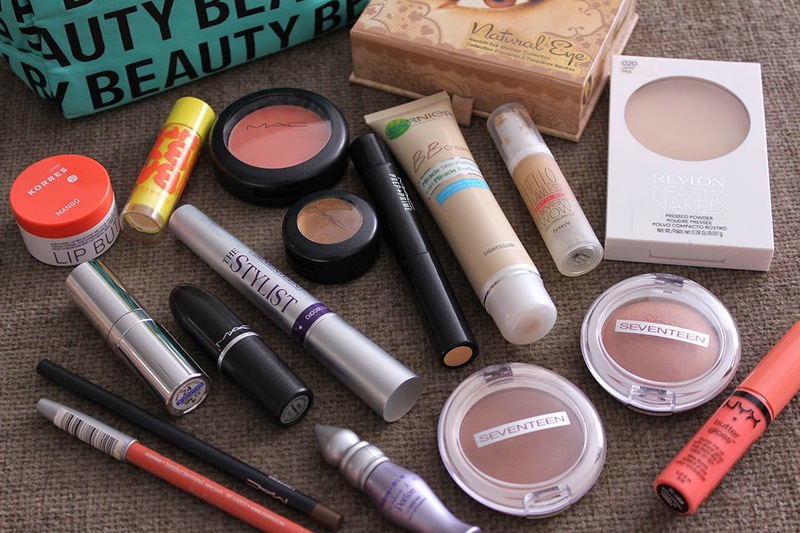 ), so it was a chance for me to show you what make up products I'm bringing with me on this trip! Just a note: I keep the makeup brushes that I'm bringing with me in a seperate makeup bag so I'm not going to show them in this post. For when my skin is in a good day and I just want bit of coverage on my face. A great foundation for night looks for more coverage, but still looking natural and dewy. A lightweight powder that provides a medium coverage, is a bit darker than my skintone so I'm going to use it when I'm more tanned. The brightening concealer I use for under my eyes, it has a thin consistency, and that makes it perfect for the hot summer weather. I wasn't planning to bring this one with me, but lately I've been breaking out like crazy. I decided not to bring one of my bronzers with me but instead bring my HG matte brown blush that can easily be used as a bronzer. A newly addition to my blush family. At beautiful bronzed-beige shade with shimmers, I'm not going to bring a seperate highlighter with me, I'm just going to use this one. I just could not leave for vacation and not bring a peachy blush with me........I just can't! Peaches is THE one for me when it comes to peachy cheeks. If you're reading my blog long enough you'd propably already know how much I love this eye palette, I could just live with this one alone in my makeup collection and use it everyday! Hot and humid weather means that nothing stays on my lids for more than 20 minutes, so an eye primer is a must have. This is new to my collection, I just started trying this out, I'm not so sure how I feel about it yet. It doesn't give much volume or length, it's just an OK mascara. One of my HG brow pencils, the shade matches exactly the shade of my brows, it contains wax which is great because it's going to stay on, even on the very humid days! A gorgeous neon coral pink shade with glossy finish, is there anything better for a summer makeup look? I don't think so! A brand new addition to my lipstick family, I really love this one for day looks. It's a light peachy shade with a bit of pink and beige, and it's also matte. A beautiful super glossy light coral pink lipgloss with no shimmers. I think everyone should have this in their summer makeup bag. The perfect lipliner for all of my coral and peachy lipsticks. A coral lip balm is a must have, the perfect lip product when I'm super lazy to apply lipstick or lipgloss. A lipbalm with SPF is a must when you're going for summer vacation, especially if you're going to the beach or the pool. Well I think I packed a bit too much this time, I'm propably going to use only half of these, but I always like to be prepaired. Do you over-pack like me? Of course I over-pack, who doesn't? haha! The product I usually forget to get is a lip balm and it's such a must-have. These days my lips are so dry thanks to hot weather and air-condition, argh! Πολύ ωραίο post, αν τα καταφέρουμε θα το κάνουμε κι εμείς! Η Natural Eye, πρέπει να είναι φανταστική για ταξίδι! Ευχαριστω πολυ κοριτσια!! Ειναι τελεια πραγματι, κ τωρα βγαινει σε πιο sleek and thin συσκευασια!